Pope Francis, the leader of the world’s more than one billion Roman Catholics, has become known as a radical agent of change since his election in March of 2013, especially with regard to environmentalism. Born Jorge Mario Bergoglio in 1936, Pope Francis hails from Buenos Aires, Argentina. Before his ordination as a Catholic Priest in 1969, he held some unusual jobs, including chemical technician and nightclub bouncer, which may have given him a deeper appreciation for the common man and his travails. 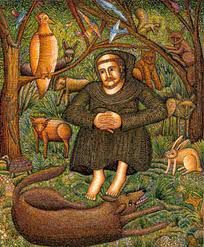 His choice for papal name, Francis, speaks to his deep respect and admiration to Saint Francis of Assisi, the Patron Saint of Ecology. Pope Francis’ radical changes to the Catholic Church, following a period of decline in public opinion and membership, reflects the legend surrounding Saint Francis. While praying at an ancient church at San Damiano, Saint Francis heard the voice of Christ saying, “Francis, repair my church.” As the first Jesuit Pope, the first Pope from the Americas, and the first Pope from the Southern Hemisphere, it may be less than a surprise that his approach to leading the Catholic Church is different than that of his predecessors. To declare, however, that environmental degradation is a sin is a truly revolutionary step in the eyes of many people around the world. wounded in battle, formed a brotherhood of himself and six other companions with a dedication to service of God whatever the sacrifice. Dedicated scholars devoted to knowledge and learning, Jesuits have served the Catholic Church for centuries and have taken vows of poverty, chastity, and obedience. The Jesuits are the largest order in the Catholic Church, and the leader of the Jesuits is referred to as the “the Black Pope” for his distinctive black attire and his perceived power. The Order’s structure is of a military-style and ethos, and the Jesuit troops are known for their willingness to go wherever and whenever needed to do their duty to God and humanity. In the 1960s, the Order decisively shifted their focus toward an emphasis of working on social justice, a sentiment echoed in the writings of Pope Francis. In June of 2015, Pope Francis released a revolutionary manifesto, an encyclical of 184 pages, entitled “Laudato Si,” translated as “Praise Be To You.” With the Subtitle of “On Care for Our Common Home,” the document represents a compilation of work and a collaboration of dozens of scientists, theologians, scholars and previous popes. One member involved in the creation of the document, the U.N. Assistant Secretary for Climate Change, Janos Pasztor, described the unique nature of the encyclical by stating: “We have a situation here in which science and religion are totally aligned.” A revolutionary concept, indeed, in our polarized society and world. The earth, our home, is beginning to look more and more like an immense pile of filth. In many parts of the planet, the elderly lament that once beautiful landscapes are now covered with rubbish. The Pope calls for all countries to adopt a circular model of production, known as sustainable development, which is capable of preserving resources for present and future generations. Additionally, he emphatically affirms that science has reached a consensus that the planet is experiencing “a disturbing warming of the climatic system,” accompanied by a constant rise in the sea level and an increase of extreme weather events. Freemasonry shares this important lesson and teaches its members to regard all of humanity as a brotherhood under God. When an individual treats each of his fellows as an equal, the application of this lesson of moral rectitude brings an increase in harmony and peace to our conflicted planet. Masons are obliged to exercise brotherly love for all humanity. As Pope Francis writes, rich or poor, we are all children of the same Creator with each person deserving support and protection. Freemasonry instructs that we are all stewards of the earth: placed here to protect and cherish the great gift of our natural world. Regardless of one’s personal beliefs on the theology of sin, we should all realize our shared responsibility to take care of each other and the planet. « Freemasonic Influences on the Architecture and Planning of Washington D.C.